The last trip was the one to New York, and as you might know, I came back on the 18th of February. Since then it has been very cold in Berlin, and I barely went outside or wasted much thought on taking outfit pictures in the cold. 😉 Because when I say it was cold, I am talking about -15°C that felt like -25°C – and I hope you understand why I didn’t want to go outside and take outfit pictures haha. But since Monday the temperatures have started to rise again, and we took full advantage of it and took some new outfit pictures. 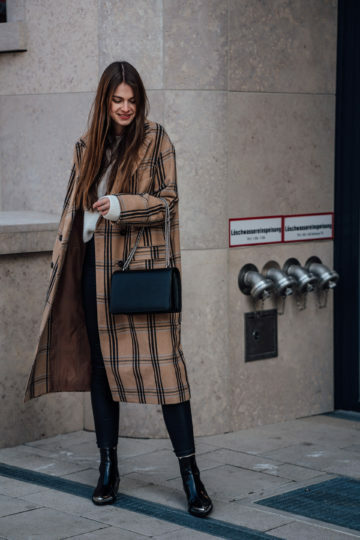 I received this plaid camel coat a few weeks ago, but it took me so long to wear it because it was either too cold, I wasn’t in Berlin, or I was sick at home. I had so many outfit ideas in mind; I couldn’t wait to wear it finally. And as soon as it got warmer, I did wear it as you can see! But how did I combine it? I opted for a casual look, that would be perfect for a long day at the office. So I combined my new plaid camel coat with a pair of black pants, black boots and a white sweater. It is a very simple outfit combination, and without the coat, the outfit would look quite boring to some of you, but I wanted to focus on the coat entirely, and that’s why I went for these pieces of clothing. To finalise the outfit, I put on a white sweater. I could have worn an all-black outfit as well (that’s what I do pretty often), but all black didn’t work with the coat. I needed a piece of clothing in a light colour, and you can never go wrong with white. And that’s it. That’s everything I can share about this outfit I was wearing on a day spent at the office in Berlin. How do you like it? What do you usually wear to the office? P.S. 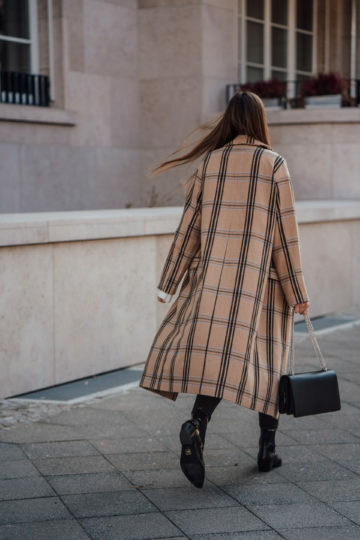 : Do you want to see more ways to wear this plaid coat? I have a few more in mind and would love to share them, if you are interested in seeing them 😉 If you want, you can also leave your ideas in a comment, and I will put your outfit idea together and share it on the blog, so you can see what it looks like! 🙂 Looking forward to reading your comments guys!